Guidelines are tough. Some of them are pretty strict, such that exceptions are seriously noticeable. For example, rookie tight ends struggle. Evan Engram didn’t (for fantasy), Rob Gronkowski didn’t, but those exceptions are significant. For the most part, we’re just impressed when a rookie can finish as a mid-range TE2, like Chris Herndon and Mark Andrews did in 2018. Other guidelines are more vague. Take the third-year breakout. Over a broad sense, that’s the most likely year for a breakout, sure. But at the same time, we have monster rookies and second-year breakouts every year. I was going to give examples, but it would have taken too long. Exceptions are as much the rule as the rule is the rule. Still, the narrative of the third-year breakout persists, because every year some third-year players do find that breakout. Exactly what quantifies a breakout is subject to debate, but you could argue that the 2018 list of third-year breakouts includes Derrick Henry, Kenyan Drake, Tyler Boyd, and Austin Hooper. In 2019? I think some of our third-year breakouts will be some of the biggest fantasy storylines of the year. To identify the third-year breakout candidates, we first have to eliminate the players who have already had their breakout. Again, exactly what constitutes as a breakout is fair to debate, but I’m comfortable eliminating these players from “third-year breakout” status under the argument that they have done their breaking out already. These players might all be great in 2019. Some of them are very likely to be. But unless we get, say, a QB1 season from Trubisky, there’s not much these guys can do that we’d call their breakout year. Howard was the main inspiration here. He was well on his way to a 2018 breakout before foot and ankle injuries in Week 11 ended his season. He did lead all tight ends (min. 30 targets) in PPR points per touch, putting up 3.54 points for every time he touched the ball. Only Kittle and Travis Kelce had higher receiving grades than Howard. 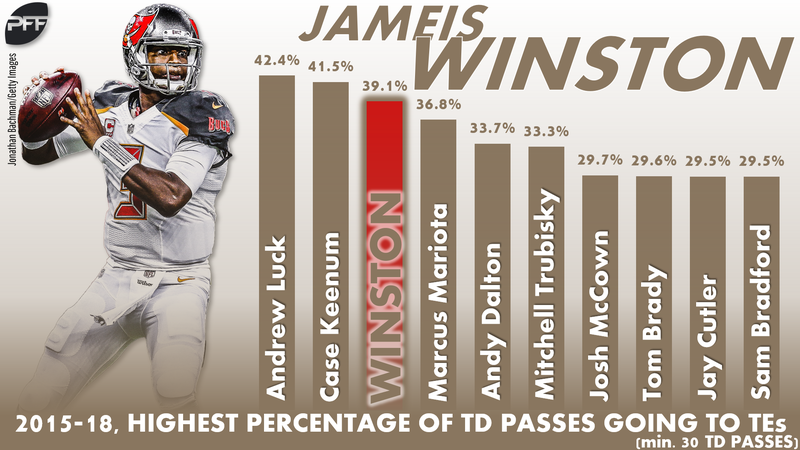 He should have Jameis Winston as his quarterback all year, which has typically meant good things for TE production — since entering the league, 39.1% of Winston’s touchdown passes have come to the tight end, third-most in the league (and he was highest in the league before the back stretch of the 2018 season. Adam Humphries looks likely to leave Tampa Bay as a free agent this offseason, and DeSean Jackson and fellow tight end Cameron Brate have been rumored as possible cuts as well. Open up some targets for Howard, give him a healthy year, and he has a good shot at breaking into the top tier at tight end. Williams had a little bit of a breakout last season, supported largely by his likely unsustainable touchdown rate. Normally, a scoring rate like that would be cause for calls for regression, and while odds are good Williams won’t score as often in 2019, he won’t need to if his targets rise. And they should, after a year in the offense (he was hurt for a big chunk of 2017) and with Tyrell Williams moving on in free agency, Williams’ ceiling in 2019 is a low-end WR2 — higher if Keenan Allen gets hurt, which is always on the table. On top of that, we need to see the Titans give Davis some other weapons in that offense. Once Delanie Walker got hurt and Rishard Matthews was released last year, the receiving offense was basically Davis and the Pips. That led to Davis seeing shadow coverage five different times (from Tre’Davious White, A.J. 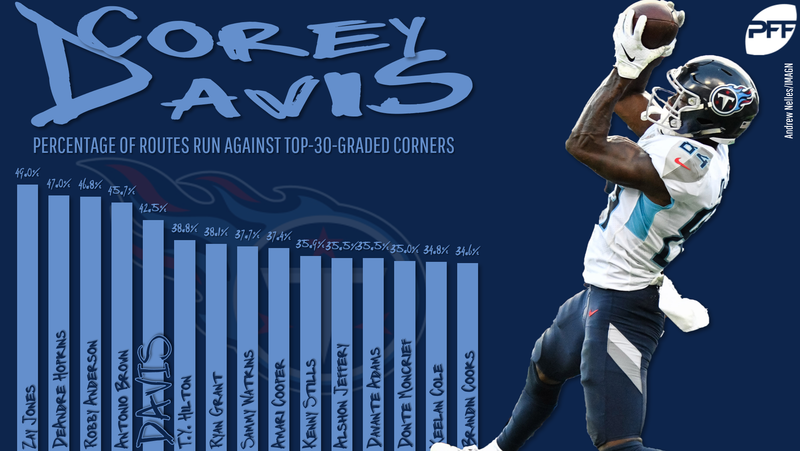 Bouye, Casey Hayward, Stephon Gilmore, and Josh Norman) and running the fifth-highest percentage of his routes against top-30-graded cornerbacks. Give him a competent No. 2 receiver to soak up some of that coverage and his breakout could be significant. Continuity is a football player’s friend. Njoku started 2018 with Hue Jackson as his head coach, Todd Haley as his offensive coordinator, Tyrod Taylor as his quarterback, and Josh Gordon as one of the wide receivers. By the end of the year, three of those were gone and Taylor was benched. We don’t know the ceiling of the Cleveland offense in 2019, but there’s every reason at the very least to think there will be exponentially more continuity in the offense. Njoku might not have Howard’s ceiling, but he has easy top-six or top-seven TE potential. The first four games of Cook’s career were great. He totaled 444 yards frim scrimmage, scored twice, and was RB9 for fantasy. But then he tore his ACL, missed the rest of the year, and struggled to stay healthy in 2018. Now more than a year removed from that injury, and with Latavius Murray heading into free agency, Cook is primed to improve on his standing in his third year. Remember that he was considered maybe the best back in his draft class before combine season started in 2017. Godwin’s 2018 was almost too good to be included here. If you want to say he already broke out, I wouldn’t argue hard. But if not, he’s set to enter 2019 as the No. 2 wide receiver in what was maybe the league’s best air offense in 2018. The same faces leaving town (or maybe leaving town) that could benefit O.J. Howard work in Godwin’s favor as well. The Texans initiated Foreman slowly as a rookie. He didn’t play more than 24 snaps in a game all year. His best game of the year — 65 yards and 2 touchdowns in Week 11 — also happened to be his last, as Foreman ruptured his Achilles in that game and was lost not only for the rest of 2017 but for essentially all of 2018 (he played in Week 16 and the team’s Wild Card loss, getting eight carries total across the two games). Lamar Miller’s been a disappointment in Houston, and if the team doesn’t bring in a new ball-carrier this offseason, Foreman could unseat him in due time. Ross is behind A.J. Green and Tyler Boyd in the pecking order, but new head coach Zac Taylor comes from a Rams offense that made good use of three receivers. If that happens in Cincinnati, he’s got a shot. Samuel had a mini-breakout in 2018, as WR16 in Weeks 11-14 with 240 yards and two scores. He’s going to be the No. 2 (or 1A) receiver in the Carolina offense behind D.J. Moore. Westbrook was the fourth-best fantasy receiver out of the slot in 2018, and if the Jaguars bring in a competent quarterback (also if Marqise Lee can’t get fully healthy), his ceiling is huge in 2019. If Antonio Brown leaves this offseason, Switzer will likely take the slot role in the Steelers offense, with JuJu Smith-Schuster shifting outside to pair with James Washington. Any regular receiver role in the Pittsburgh offense carries a big ceiling. Clement didn’t blow anyone away replacing Jay Ajayi last year, but if the Eagles don’t bring in a back this offseason, there’s a decent chance he’ll get first crack at the job, and a full-time role always has a chance.